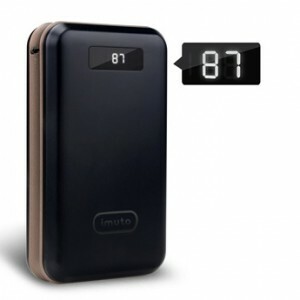 The manufacturer of this brand iMuto might not be one you’re too familiar with but if you just check out their customer reviews for this product the iMuto Taurus X4 you can see that a very high percentage of customers are very satisfied with this product. There’s not any information on the “about us” section on their website but iMuto states they have an “Affordable high quality approach” which you can believe based on this product. This company does mainly make portable chargers and although a reputable and established company is still important but for products such as a portable charger/power bank, you would probably be more concerned with the product being high quality as it’s a fairly cheap product rather than the company behind the product. Can charge the iPhone 6 almost 8 times, iPad Air almost 1.7 times, Galaxy S6 almost 5.7 times, Galaxy Note 4 almost 4.8 times. Compatible with Apple and android smartphones, tablets and other USB charged devices. Two USB ports will enable you to charge two devices of any compatible type simultaneously. Smart digital screen displays the remaining power the Taurus X4 has. This display is hidden until the unit is activated. Multiple smart protection system prevents your devices from over-charging, over-voltage, over-current and short circuit. Takes between 11-13 hours to fully charge the Taurus X4 itself. The very large capacity makes the Taurus X4 very useful especially for long journeys or trips where you might not have access to a power source such as camping. The digital screen display comes on when you either charge a device or when you charge the portable charger itself. Very handy to have as you’ll always know how much power is left in the Taurus X4. The built-in LED flashlight is quite powerful this can be very useful. Quite bulky so it probably wouldn’t fit in your pocket but if you were carrying a bag it’ll be fine. 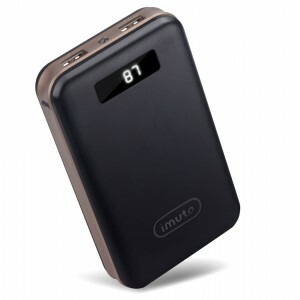 The iMuto Taurus X4 Portable Charger is definitely more than capable of supplying power to your devices for a few days, depending on how often you’re using it of course. Smaller portable chargers that hold much less capacity such as the Anker Astro Mini will only be able to deliver around one full charge to most smart phones so will only be ideal for a day out. As the Taurus X4 is quite bulky you probably wouldn’t want to be carrying it around in your pocket, but if you’re carrying a bag then this will easily slip into your bag. Carrying around this power bank may also be more useful than you think as it’s equipped with a pretty powerful LED flashlight.